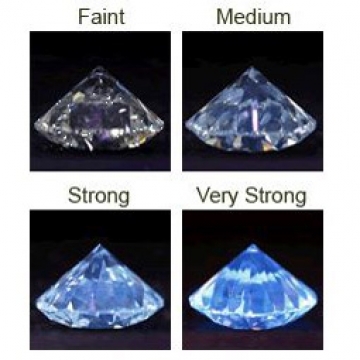 Fluorescence in a diamond is a characteristic that can make a diamond appear to change colour when it is emerged under ultraviolet light. This can include fluorescent lights in your home and the natural sunlight. This is one of the characteristics that are difficult to judge the impact that it has on the diamond from just looking at it on paper. It is best to view the diamond and make an informed decision as to if you like the scintillation that comes from the diamond.